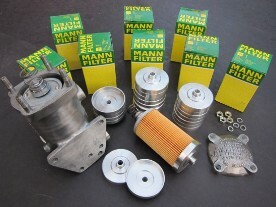 Several years ago, we developed our own oil filter conversion kit. The original design has been adapted to accommodate a modern filter cartridge instead of the old felt cartridge which is now an obsolete item and difficult to source. New replacement paper filter element cartridges now offer a far superior level of oil filtration and when replacing, are readily available. We sell these replacement cartridges at cost price. The modern replacement filter cartridge is seated on a separate, precision metal spun platform which incorporates a recess section in order to utilse the nitrile rubber grommet at the base of the filter cartridge. Enthusiasts today, generally take better care of their engines including more frequent oil changes compared to 1930's motoring habits. The original oil filter by-pass valve which used to sit on the top of the oil filter element has become largely redundant in it's functionality and never provided a pressure tight fit to the filter cartridge. Therefore, VMGP have designed a pressure tight spring locator to replace this component. The metal spun platform incorporates a tapered spout which is then gently tapped into the hole within the base of the housing to lock into position. However, it has become apparent that the MG factory were originally using 3 separate sources for supply of the original filter housing and as such, we are aware that there are 3 different diameters on the oil exiting hole within the base of the casting. We therefore supply a nitrile rubber o-ring gasket to fit between the filter housing where the factory part with the larger exit holes are being used. There are marginal differences in manufacturing tolerances depending on the make of the new filter cartridges. Although the FRAM CH4747 and Coopers G586 cartridge are a very similar product, we generally use the Mann H614x. All 3 cartridges were originally designed for use on 1970s Mercedes engines and therefore provide truely excellent levels of filtration for the MMM engine and at a very respectable price. Our oil filter conversion kit has become the leading filter of choice for the MMM enthusiast's in terms of both its functionality and price. We buy in so many filters that we can pass our quantum discount on to the customer. An alternative Volvo cartridge system being offered elsewhere boasts excessive filtration qualities, is around four times the cost of our cartridge and is reported to lack an appropriate oil pressure seal to its top face. We also supply the oil filter housing and replacement lid for the J4, L and K Type and Wellseal jounting compound.